Base price includes letters stitched across the front. Add a line of text? 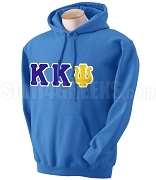 Kappa Kappa Psi sweatshirts are a great way to keep warm while showing your Greek spirit! Customize this crewneck sweatshirt to your liking with your sorority symbols and more. All of our sweatshirts are made of heavy blend cotton and are fully customizable.